Guatemala's flora includes many endemic orchids and commercially important fruit trees. 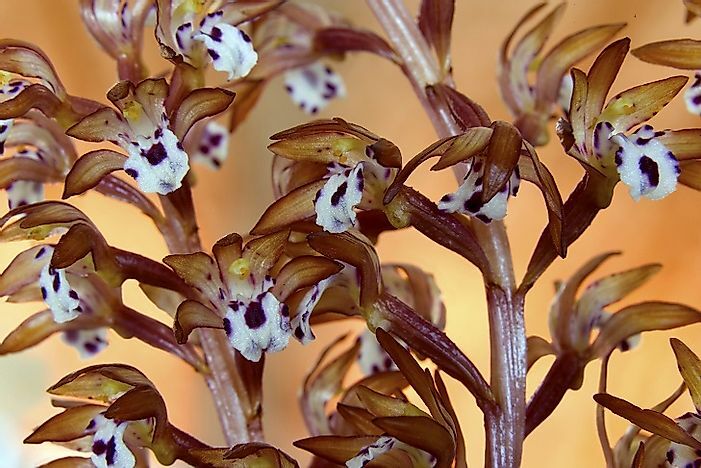 Guatemala’s flora includes many endemic orchids and commercially valuable fruit trees. The tropical, cool, and temperate climate zones and the 14 ecological regions of Guatemala support the growth of an abundance of plant species. Over 8,000 plant species have been identified in the country, with a significant number of them being native or endemic. The Spotted Coralroot Orchid (Corallorhiza maculata) is classified as part of a genus of coral-root orchids, characterized by their possession of a similar underground branching rhizome. Its rhizome root appears coral-like and spots are visible on the flower’s white lip. The plant’s stem is leafless and it grows to a height ranging between 15 and 55 centimeters. The stem can produce a maximum of 50 flowers between June and September. The plant assumes a range of colors, from brown red to bright yellow. The Spotted Coralroot Orchid has mainly been identified throughout coniferous and mixed forests. The plant thrives in fertile soils and abundant leaf litter. The plant is not in immediate threat in Guatemala and there are no identified conservation programs. The Avocado (Persea americana) is another of Guatemala’s native plants. The tree grows to between 40 and 80 feet and produces the avocado fruit which can either be pear shaped, round or oblong and which has varying color, size and texture. The fruit has a large seed and its flesh is greenish yellow to bright yellow. The tree self pollinates in part and is also pollinated by honeybees and other insects. ‘Haas’ is the most common cultivated avocado in Guatemala. The tree thrives in a tropical climate and in well aerated soils. The fruit is commonly used as a culinary dish in Guatemala and has not been affected by any significant environmental concerns. The Huito (Juniperus standleyi) is a juniper species that inhabits Guatemala and Mexico. In Guatemala, the plant is commonly found in the regions of San Marcos and Huehuetenango. Huito tree grows to a length ranging from 5 to 15 meters. The tree has needle-like and scale-like leaves and berry-like cones. The tree inhabits open pine woodland and it has also been spotted on limestone ridges and rocky edges. The tree grows in proximity to grasses and shrubs. Its altitude range is between 3,000 meters and 4,250 meters above sea level. The tree is listed as endangered and it continues to decline in numbers. Deforestation and degradation of its habitats are severely threatening its sustainability. There are no significant conservation efforts identified for Huito in Guatemala. The Caribbean Pine (Pinus caribaea) is a species with abundant numbers in Central America, where it inhabits pine forests. Caribbean pine mainly grows to between 20 and 35 meters, although it can reach a maximum of 45 meters, and it has a bark which ranges from reddish-brown to grayish. The tree has needle-like leaves and it has both female and male cones. The female cones are produced when the plant is three or four years while the male cones take longer to appear. The tree grows rapidly, and its growth is directly affected by rainfall. Caribbean Pine thrives in well-drained, acidic soils, often near the coast. The tree is listed as Least Concern, and there are no identified conservation efforts in Guatemala. Other native plant species of Guatemala include Flat-Leaved Vanilla (Vanilla planifolia), Ilama Fruit Tree (Annona diversifolia, Sweet Scented Lycaste (Lycaste aromatica), Netleaf Oak (Quercus rugosa), White Sapote (Casimiroa edulis), and Dickinson’s Lady Slipper (Cypripedium dickinsonianum). Although Guatemala’s native plant species are not under any widespread threat, deforestation and human encroachment need to be addressed to ensure their sustainability.